Today’s distribution business demands drastic needs – customization, easy access, and faster delivery. More than ever, distributors face challenges from new entrants to the field, and from customary competitors who’ve already made the transition to business strategies that are leaner, more mobile, more social, and driven by up-to-the-instant business intelligence. 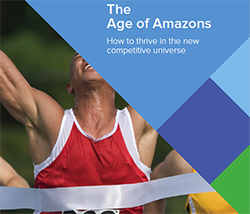 This e-book “The Age of Amazons: How to thrive in the new competitive universe” provides proven tools to help you survive and thrive in the new world of distribution. It takes agility, precision, speed, and insight to win in today’s hyper-competitive distribution marketplace.